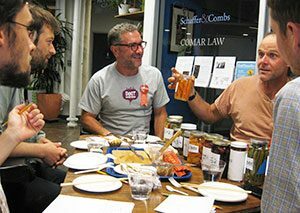 Last weekend, Dan and I participated in the fourth annual Good Food Awards‘ judging event – in the pickle category. We were psyched for this! Not only did we get to travel to San Francisco and taste LOTS of incredible pickles – we also got to meet new pickle people and connect with pickle friends we’ve made at previous GFA events. It was a fantastic experience. 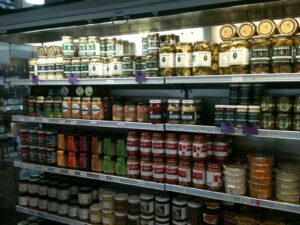 I loved tasting SO many different kinds of pickles – vinegar, fermented, krauts, fruit, onions, beets, and relishes. 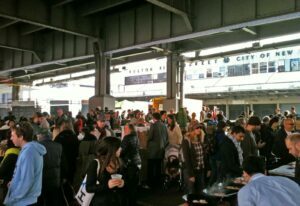 The fermented black bean and garlic paste was a highlight for me – its spicy kick was significant and enduring! I also loved the turmeric-yellow kraut packed with ginger, yum. Dan’s day was made by the vinegar pickled sea beans (the what?) – an aquatic plant neither of us had heard of, harvested from salt marshes. And those pickled cherries – nicely flavored with a little cinnamon and clove – came in handy immediately following the jar of cucumber pickles full of halved habanero peppers. Among the judges were experienced pickle-tasters, pickle-writers, and pickle-makers, and it was fun to talk details of sugar-sour balance, degree of fermentation, slicing techniques, and vegetable texture. The selection of entries were beautifully displayed – it was lovely to see the variety of veggies, colors, textures, and jars. The pickle category was expertly coordinated by Chris Forbes from Sour Puss Pickles in Brooklyn, NY and Todd Champagne from Happy Girl Kitchen Co in Monterey, CA. While Chris masterminded the organization of all those pickles, Todd kept up our spirits by making an appearance as “Chilly Dilly”, a cucurbit that is “…kind of a Big Dill”. They kept us in pickles all day long, PLUS a parade of palate cleansers to keep our taste buds primed – the highlights included some very special GFA entries from the chocolate and cheese categories once their judges were done tasting from them. Oh, and some nice selections left over from the spirits and beer categories, too. It was a wonderful place to meet and re-connect with a variety of pickle folks. It put us in a reminiscent mood, too. When we started Real Pickles in 2001, there were only a handful of businesses around the country making fermented pickles and sauerkraut. Now there are companies sprouting up all over the place!! Dan and I really appreciate meeting new companies who are perfecting the art of the pickle, and to talk techniques, recipes, and business models. We had a great time connecting with Mara from Zuké and learning about her new-ish pickle business in Boulder, CO. We also got to meet Jennifer Harris who organizes Sonoma County’s wildly popular Farm to Fermentation Festival, and Sarah Kersten of Counter Culture Pottery, who makes elegant fermentation crocks. When Real Pickles was getting its start, there were also only a handful of books about fermented pickles, or role models in the world of fermentation (think: pre-Sandor Katz’s Wild Fermentation!). Two of those early authors were Sally Fallon (Nourishing Traditions) and Linda Ziedrich (Joy of Pickling). We count ourselves very lucky that, this past weekend, we were able to meet and judge pickles alongside one of our early inspirations and teachers, Linda Ziedrich. When Real Pickles was getting its start (is there an echo in here? 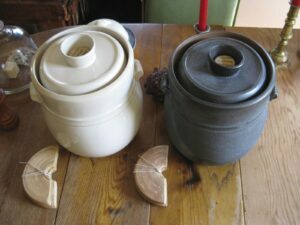 ), fermented vegetables were a food of the past, a fringe-hippie-food, only found in backwoods natural foods stores and in the pantries of homesteaders. A mere dozen years later, it is at the height of food-trendiness, the focus of many festivals (see this, this, and this), and the mark of the hippest hipster (any hipster worth his or her hand-harvested unrefined sea salt, anyway). The timing of this trend is uncanny (pun intended), as this food revival is gaining recognition from the science community, as well. In just the last few years, scientists have been recognizing the amazing benefits of fermented foods to our overall health – benefits that our ancestors enjoyed and came to depend on for thousands of years, but that we have unwittingly excluded in our transition to more processed and industrialized foods. In his newest book, Cooked, Michael Pollan enumerates dozens of recent scientific articles relating the importance of beneficial bacteria in protecting our intestinal health, promoting our immune defense, and maintaining our mental well-being. Scientists are also recognizing that our recent deficiency in fermented foods teeming with live cultures may be part of the reason for some of our generation’s most serious health problems, such as allergies, obesity, seasonal colds and flus, and some cancers. Pickle, anyone? 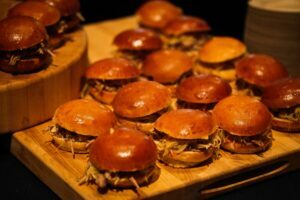 But back to the Good Food Awards… needless to say, there was plenty of enthusiasm among the pickle judges and aficionados we spent the weekend with. 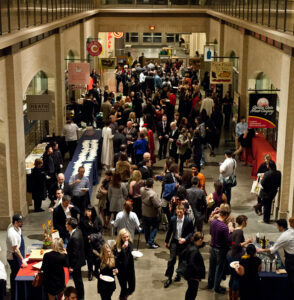 One of the best things about the Good Food Awards is that it is not just a contest, where your product is pitted against those of your peers and competitors. So much of it is about connecting food producers, inspiring conversation, trading ideas and methods, and giving each other a pat on the back. Being a food producer can be isolating, especially when regionally-focused, so it can be SO inspiring to talk to other people with similar experiences. Really, in the world of fermented pickling, we are not competitors. 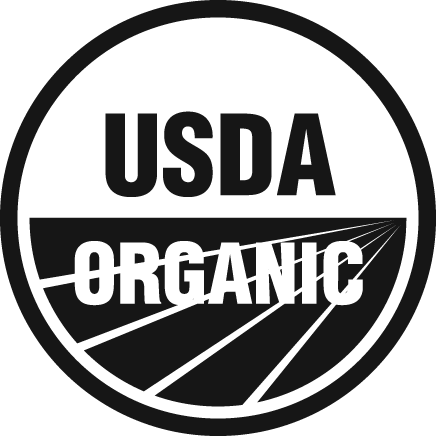 The more producers there are, the more we are recognized as a legitimate food category. Participating in the Good Food Awards has given us a real sense for our larger community of fermenters and fellow picklers, and we are so happy to be a part of it! 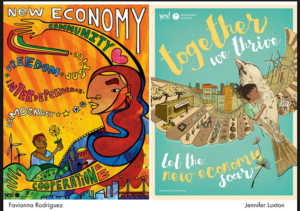 A Community Perspective: Investing in a Better Food System! We are honored to feature this guest post from the leadership team of the Pioneer Valley Slow Money chapter. 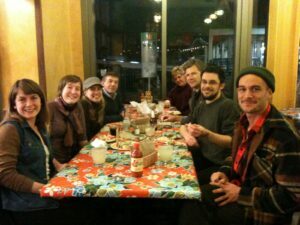 The burgeoning Slow Money movement is about “investing as if food, farms and fertility mattered.” We at Real Pickles are excited to be offering a local investment opportunity of this kind as we work to transition our business to a worker-owned co-operative. And, we are thankful to our local Slow Money chapter for its support! Living where we do, in the Pioneer Valley of Western Massachusetts, nestled within the regional community of New England, we are participants in an exciting movement. Over the past several decades, we have seen an increase in the number of farms and farmers in the region, reversing decades of decline. 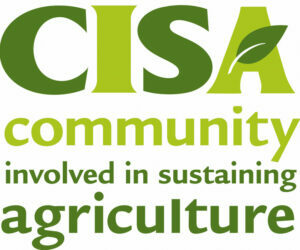 Many of us have ample opportunity to join a local CSA and to shop at one of the many new farmer’s markets that are now part of our daily economic life. Both producers and consumers are driving positive changes in the food system, as more producers build businesses with a deep commitment to their local food system and more consumers shift their buying patterns in support of local food. 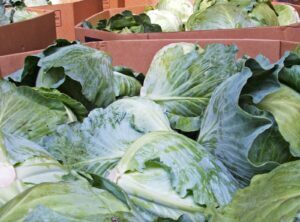 And, while we are all pleased with the positive trends, few, if any of us, feel satisfied with that pace, or the current scale of the local food economy in our region. So, what’s slowing us down? As Woody Tasch suggests above, there is a missing piece to this economic equation. We are missing the investors in our local food system. Slow Money, as a movement, is growing alongside of the local food movement, designed to help that movement obtain the type of investment capital it needs. Many of us have been engaged in heated conversations, where we decry our inability to move a portion of IRAs or other investments out of the traditional investment world and into our local economy. There is a lag, a logjam of intent, when it comes to finding a way to match our consumer commitment to local food with an equally straightforward investor commitment. But, as people who have been engaged in this space have learned, it’s not easy to match our mission zeal up to investment opportunities. For one thing, there are not many opportunities. For another, as movement leaders, we are asking for our businesses to be mission-focused in a way that supports a local (food) economy. We want them to treat their suppliers and employees well, use best ecological practices, and maintain a long-term commitment to local ownership and place. Yet, such mission requirements do not typically provide investors with the kinds of returns they seek, or a quick way to get their money back. Slow Money seeks to provide patient investment dollars that can finance businesses. These dollars would not pressure them to sell out on their mission commitment. The Slow Money movement rests on a thesis that there are good, viable businesses that can scale up to the size of the local economy which houses them. The movement seeks businesses who can demonstrate the principles we all seek, who really need this new kind of patient, or “nurture” capital. The Pioneer Valley Slow Money Chapter – operating as a working group within the PVGrows network – is pleased to be working with Real Pickles to assist them in meeting their finance challenge. 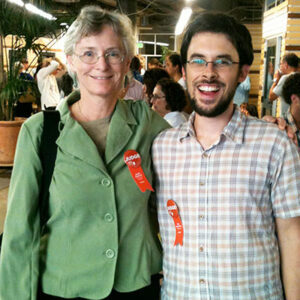 Real Pickles has demonstrated commitment and business competence in light of the mission elements we all seek. They buy from local/regional family farmers, paying them fair prices. Their transition to a worker co-operative continues a tradition of fair and equitable treatment for its employees. 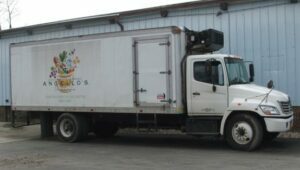 Real Pickles is committed to organic agriculture in the field, and energy efficiency and solar power at its facility. And long-term commitment to local ownership and place is what their co-op transition deal is all about. 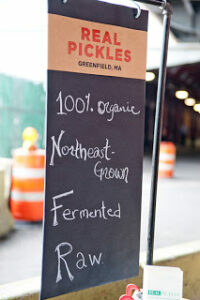 The team at Slow Money is excited to support Real Pickles because they are the real deal. Their commitment to principled business makes it hard for them to offer investors the kind of return they are accustomed to seeing in the world of Fast Money. But, they embody the change we seek, and offer supporters of local food an opportunity to invest in a way that is consistent with their consumer commitment. Real Pickles has worked hard to make this offer viable and available. We are proud to help them get the word out. For more information about Real Pickles’ co-op investment campaign, visit www.realpickles.com/invest. Who does? 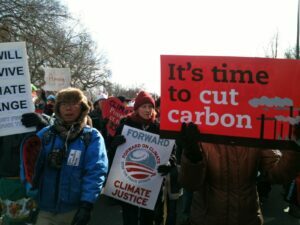 Dan and I traveled down to Washington D.C. this past weekend to be part of Forward on Climate, the biggest climate rally in U.S. history. We joined over 40,000 people on the Mall near the Washington Monument, and then marched to the White House to make sure that our message was heard. 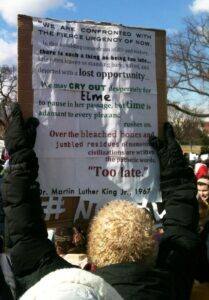 Our message was serious, but we had a great time conveying it. 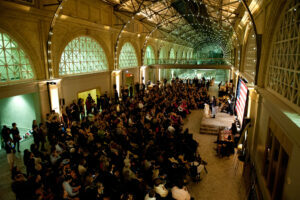 The Sierra Club, 350.org, and 160+ other organizations sponsored theevent, and Rev. Lennox Yearwood of the Hip-Hop Caucus emceed the show. 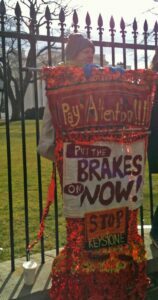 We heard from author and activist Bill McKibben, tribal leaders from British Columbia, Alberta, and Oklahoma, and even a member of the 1% (a billionaire investor) who came out to let us know that he saw the Keystone XL pipeline as a very bad investment. All spoke out strongly against the pipeline that is proposed for transporting oil from Alberta’s tar sands to the Gulf Coast for refining and exporting. The quantity of oil estimated to be locked up in the tar sands is equal to all the oil that humanity has ever yet used – and if burned would raise the concentration of carbon dioxide in our atmosphere from an already dangerous 400 ppm to a frightening 600 ppm. Climate change is a big deal to us at Real Pickles. Our work here is to strive to create a business that is sustainable and energy efficient, one that helps to build a strong and healthy community. Many of the principles on which we base our decisions are principles that also define the climate movement. Climate change is also central to the work I do outside of Real Pickles: managing communications and outreach for the Northeast Climate Science Center (NE CSC) based at UMass Amherst. The center is a federal-academic partnership that works to provide tools to natural resource managers as they plan for a future of changing climate. 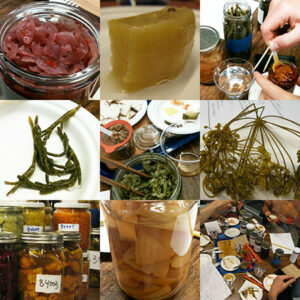 My two workplaces – Real Pickles and the NE CSC – span a broad spectrum between big picture and community scale action. In both, I think about the issues surrounding climate change on a daily basis and hope that our government will take action to prevent the worst, even as many citizens prepare for it. 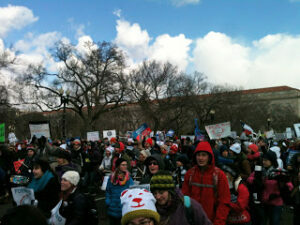 For these reasons, I was thrilled to join the 40,000+ protesters in Washington on Sunday. We felt very inspired by the attendance and the vibe at the rally. 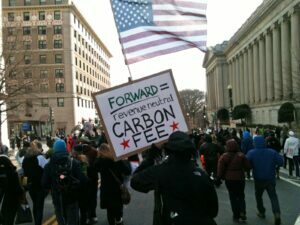 People traveled from all over the country to participate and show their support for a low-carbon future. Together, we shouted and we shook our fists. We danced to the drum line and the brass band. 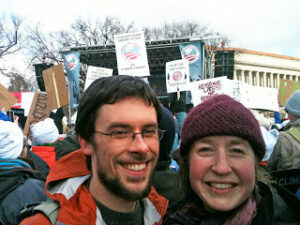 And we danced extra hard to keep warm – did I mention that it was a crisp 25 degrees with a brisk wind? 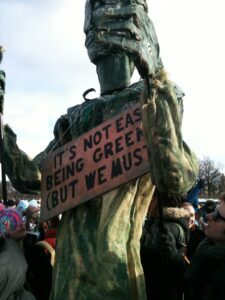 There were signs declaring that “fossil fuels are SO last century” and stickers against hydrofracking (“No fracking way!”). The tribal leaders spoke of the incredible pollution risk posed by the Keystone XL pipeline: “Oil always spills. It is not a question of if, but a question of when.” And there were numerous chants in favor of solar and wind power, with Dan and I occasionally adding in a good word for conservation as priority #1. Turnout for the event far exceeded expectations, and we left feeling particularly proud of the Western Mass contingent: we heard that 5 or 6 full buses traveled to the rally from the Pioneer Valley, yeah! We took a bus down from Greenfield and were serenaded in the parking lot by activists unable to join us – with songs like CSN’s “Long Time Comin'” – before we boarded the bus and set on our way. Amidst the enormous crowd, we didn’t run into many Western Mass folks but did see our neighbor Alden, owner of the People’s Pint, toward the end of the rally. We were hoping he would have 2 pints of his Farmer Brown and a couple of pulled pork sandwiches to offer us, but alas – we’ll have to wait until we get back to Greenfield. We’re including a few photos from our trip – we hope that you enjoy! 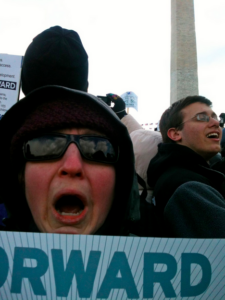 Addie tells Obama that she “don’t want no climate drama”. 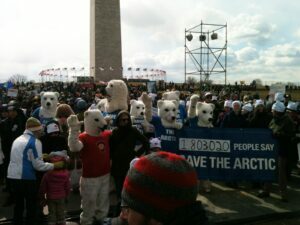 The polar bears show up to the rally to advocate for their future existence. 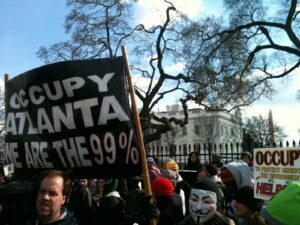 The Occupy movement lives on! Gotta put the brakes on. Thanks very much. My partner Addie and I are thrilled to be back at the Good Food Awards for a 2nd time as part of what is again a fantastic pickle posse! 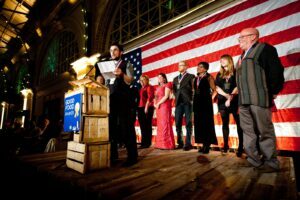 I think pickles are a really great fit with the Good Food Awards, with its focus on helping to bring good food back into the American diet, promoting both taste and social responsibility. Pickle-makers in the United States have much to offer on both counts, and I would say the winners here tonight are clear illustrations of that. Those engaged in the craft today are drawing on pickling traditions from around the world to produce tasty pickles, as three of tonight’s winners did – Farmhouse Culture, Spirit Creek Farm, and Firefly Kitchens – in creating a version of the Salvadoran classic, curtido. And we are drawing on the American pickling tradition, as Cuisine En Locale did to produce their winning pickled peaches (which I’m very excited to try). Some of us here (like Olykraut) are using the traditional fermentation process to make our pickles, while others (like Miss Jenny’s and Let’s Be Frank) are using the modern vinegar approach. Both are great ways to preserve the wonderful flavors of organically-grown produce and indeed to enhance those flavors along the way. Pickle-makers are also making major contributions in the realm of social responsibility. Our special tool of course, our not-so-secret weapon, is our ability to take perishable fruits and vegetables and make them non-perishable, and yet still tasty and nutritious. But, as it turns out: pickles are not obsolete anyway. Because, as more and more Americans are coming to realize, our industrial food system is broken. It doesn’t work. It’s causing or exacerbating a huge list of ecological and social ills, from climate change and soil erosion to human disease epidemics and the decline of our rural economies. 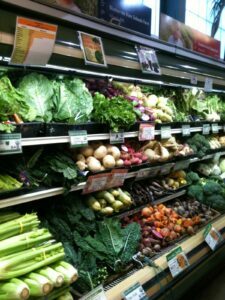 What we need instead is a regionally-based organic food system where everyone (not just the privileged few) has access to healthy food from small producers located (whenever possible) within their own region. And in such a food system, pickles are an essential food: one that can keep people eating nutritious fruits and vegetables from regional sources all year long, regardless of how cold the weather gets. Our contribution to building a regional, organic food system is an important part of what we pickle-makers are being honored for tonight. So many of the winning producers here have developed close relationships with their local farmers to source their ingredients, as we have done in Massachusetts at Real Pickles, Sour Puss Pickles has done in New York, and Emmy’s has done here in California; while others are growing ingredients themselves, like Ann’s Raspberry Farm. And, thus, just as practitioners of each craft being honored here tonight are contributing to the task of making “good food” the norm in America, so too are those of the pickling craft. 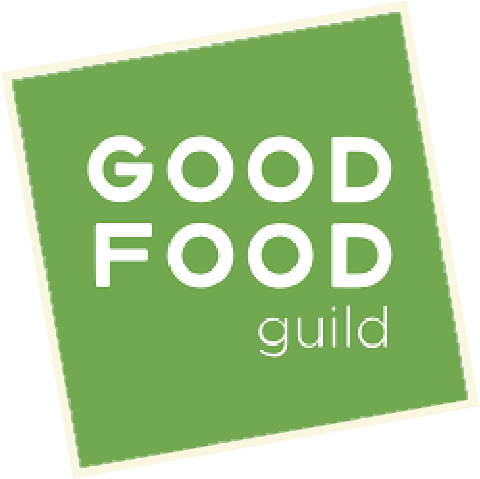 And, I think I can safely speak for all of my fellow pickle winners when I express sincere gratitude to the organizers of the Good Food Awards for doing your part to help promote our work and achieve wider recognition for it. So, thank you very much.